It is ultimately, SWEEETTT!!! 1600×1200 at 85 Hertz is astonishing. Everything is so small! (In a good way.) I even tire myself moving my cursor from corner to corner! Now that’s not to say that the monitor is perfect. Being a not-so-branded brand (or at least not well-known) there were some issues. For one, I forgot to check the box and the monitor quality. They sold me a display unit! A crappy one, at that – shadows, occasional diagonal stripes, trace lines to the left and right of icons, patterns and ripples, bright edges, etc… not good. I returned it for a new unit, and this one’s better, but it still had little trace lines and ripples. Though I think the ripples look nice, plus they only come up at anything higher than 1024×768! 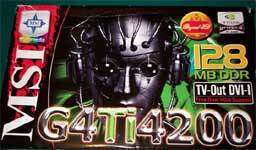 There’s another new gadget in my small world – an MSI Geforce 4 Titanium 4200 with 128 Megabytes of DDR RAM! This entry was posted in Geek on November 19, 2002 by 2konbla. i thought ur at least 21! !